Summer is almost here – and just as summer arrives, Pine Tree Camp’s gates will open for its 71st summer season. But what is it that makes Pine Tree Camp so special? Let me paint a picture for you…our campers, though they range in age and come from all corners of Maine, have something in common. They experience significant barriers in everyday life. Barriers that are hard for many of us to comprehend. Imagine the feeling of isolation, not having a friend you can talk to or count on, being unable to participate in the simple joys of life, like playing on a playground, talking a walk in the woods or going for a swim to cool down on a hot summer day. This is the reality for many of our campers. At Pine Tree Camp their lives are different. The impact is immediate and it stays with them forever. 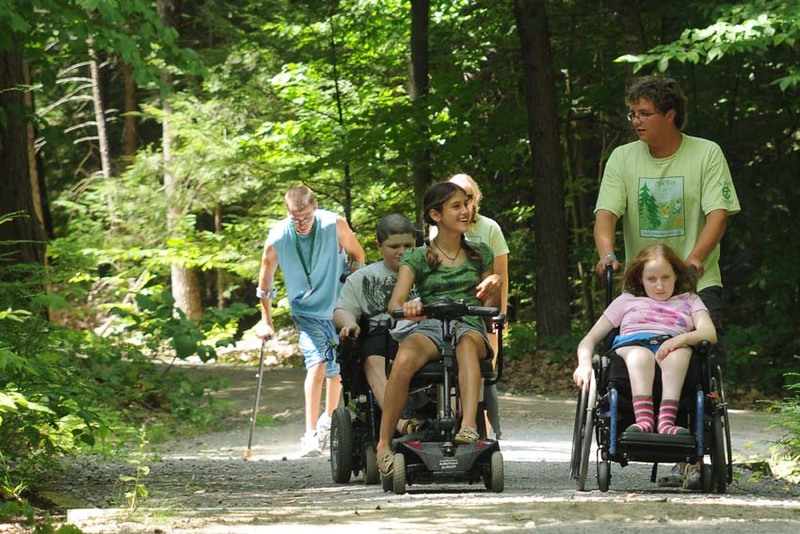 As soon as they turn down Pine Tree Camp’s dirt road, they enter a world where they are one of the gang rather than “the one with the disability.” They make friends for the first time. Friends who understand the daily challenges of living with a disability. Friends who encourage each other to participate in all of the activities Pine Tree Camp offers, like kayaking, fishing, swimming, hiking on accessible nature trails and even sleeping overnight in a real tent. A team of counselors, who give their all to provide care and support 24/7, are at each camper’s side providing the personalized care and support they need to fully participate in each activity. No one ever sits on the sidelines. We are proud of our promise to welcome all campers regardless of their ability to pay the $1,900 tuition and we couldn’t do it without you. That Open Door policy began in 1945 and remains steadfast because of you. Each year, Pine Tree Camp provides 99% of our campers with full or partial tuition assistance. Pine Tree Camp receives no state or federal funding. Please help today! Your support of Pine Tree Camp’s Campership Fund will make big difference to our campers – a lasting difference. Your support will transform lives. Thank you in advance for giving.